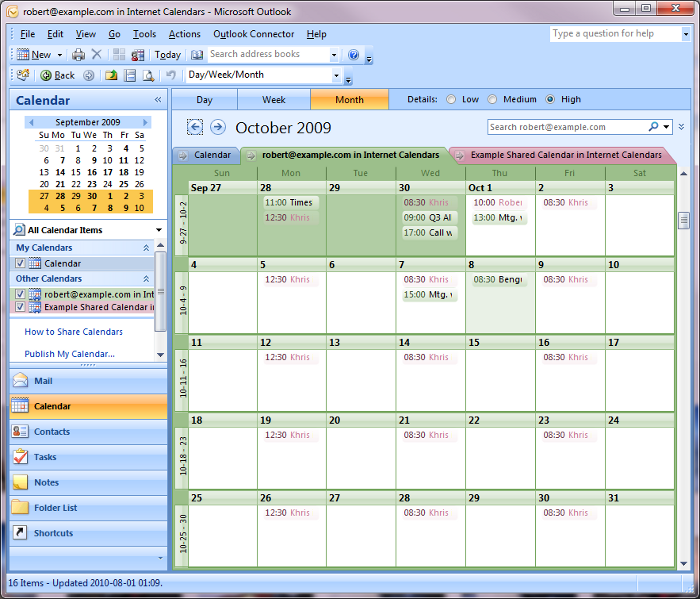 Outlook and Google Calendars overlaid in one view. The color of an item indicates which calendar it's from. If you’re a regular Gmail user, you may follow the directions at How-To Geek. However, if you’re using Google Apps for your domain/business (or organization, family, or whatever), you would likely run into a couple obstacles with those steps. Go to the ‘Google Apps control panel’ for your domain, which you can get to by clicking on ‘Manage this domain’ at the top of your email inbox. As documented at Google Apps Admin help, this will allow users to share their calendar information with people outside your domain. This includes guest list, location, and description. 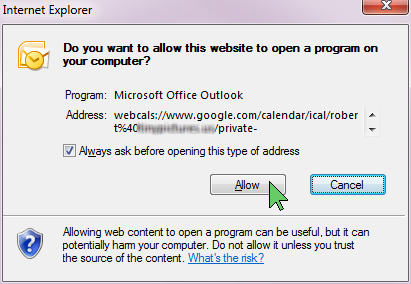 We need to do a tiny bit of URL hacking and Internet Explorer’s help to add this to Outlook. This entry was posted in Personal Technology, Web Technology. Bookmark the permalink. Does anyone encounter this problem? Or maybe have a solution for it? 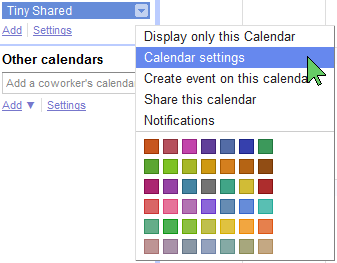 As far as I can see this only works for shared calendars (which everybody can see and can turn op in google searches). Thunderbird + lightning can open and update the calendar. Oops, previous post was incorrect. Got it to work using the https url (private ical) with the %40 replaced by @. 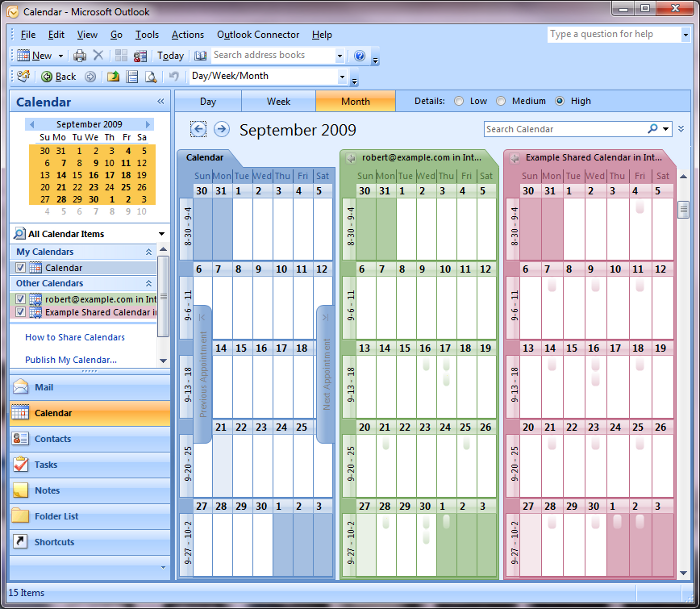 I used account settings => internet calendars => new to add the calendar. This all works exactly as advertised right up until “done!” When I go to calendar view, however, my Google calendar does not appear in the calendar list and although a test calendar entry sync’d both ways (GCal to Outlook and vice versa) my existing Outlook calendar entries did not sync across. Any ideas????? What do I have to do to update it and, when updated, will it appear in my calendar list? Works perfectly with Squirrelmail and Shared Calendar (v2.1 beta) plugin, thanks! Thank you so much, i have struggled with this for too long. Now i can integrate my calendars between work and home. @Branko, thx that worked for me! I have tried all those variations above, and still get the message: Cannot verify or add…. By gosh, I got it… got my Gmail calendar to appear as other calendar in my Outlook, at least. Still unsure why duplicates showing on my phone/imac/google web calendar, though. Duplicates don’t seem to show on my Outlook (work) platform. (only, I used the Private Address: ICAL link from Google, and then did the whole change https to webcals steps). Pchef – thank you, that was genius! This still doesn’t work for me. Could it be that the original of this shared Google calendar resides in another company’s network? I get all the way through the change of webcals and allow only to get that same “cannot verify or add” message. I even tried changing %40 to @. Any more suggestions? Thanks. I have also tried to reset the Google Private ical address and but that does not work either. 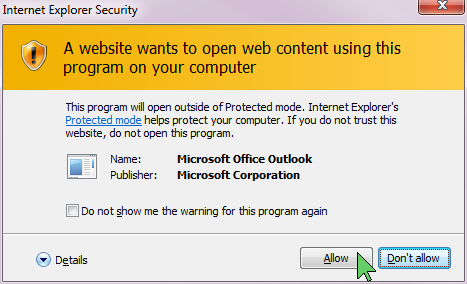 I only get the one security dialog box in IE (not the two shown above) and one in Outlook. 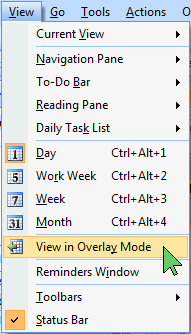 Works perfect with Outlook 2016 – thanks! Just tried the above trick of changing the URL in IE and it worked great, many thanks!